Pandora-Gilboa’s Eli Phillips fights for a rebound against Marion Local’s Matt Rethman, left, and Jack Buening during a Thursday Division IV state semifinal in the Value City Arena at the Schottenstein Center in Columbus. See more game photos at LimaScores.com. Marion Local’s Nathan Bruns helps guard Pandora-Gilboa’s Drew Johnson during a Thursday Division IV state semifinal in the Value City Arena at the Schottenstein Center in Columbus. Pandora-Gilboa’s Jared Breece drives against Marion Local’s Collin Everman during a Thursday Division IV state semifinal in the Value City Arena at the Schottenstein Center in Columbus. Marion Local’s Collin Everman defends Pandora-Gilboa’s Grant Murphy during a Thursday Division IV state semifinal in the Value City Arena at the Schottenstein Center in Columbus. Pandora-Gilboa’s Drew Johnson puts up a shot against Marion Local’s Justin Albers during a Thursday Division IV state semifinal in the Value City Arena at the Schottenstein Center in Columbus. 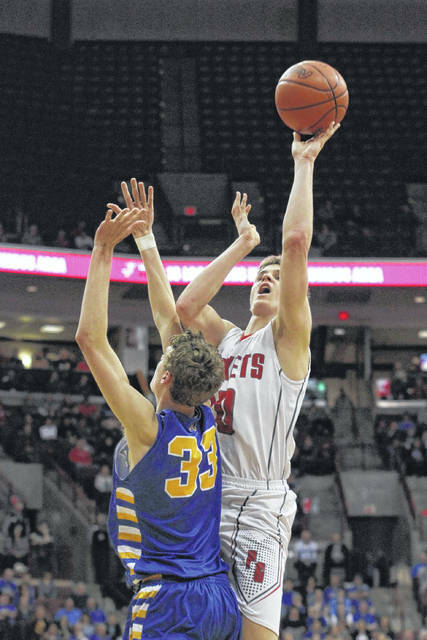 COLUMBUS — It was tough to find Nathan Bruns in the first half of Marion Local’s 56-54 win over Pandora-Gilboa in a Division IV boys basketball state semifinal on Thursday, but impossible to miss him in the final minutes. Bruns, a 6-6 junior, scored Marion Local’s final seven points and 10 of its last 13 and had four rebounds and a steal in the fourth quarter after playing only four minutes in the first half after picking up two quick fouls. 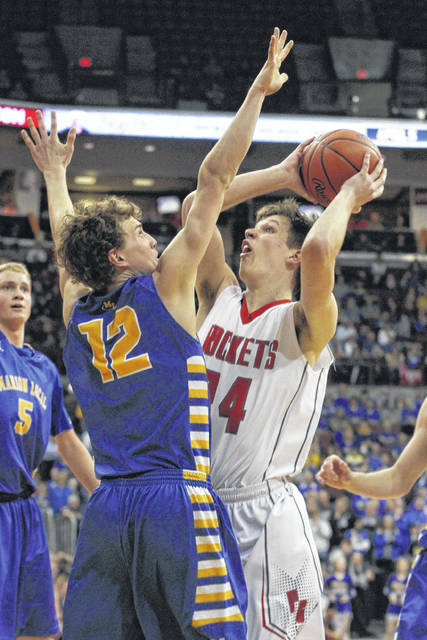 Tyler Mescher (17 points, 6 rebounds) and Bruns (15 points, 7 rebounds) led Marion Local (24-4) into the Division IV state championship game on Saturday against Cornerstone Christian Academy (21-7). Drew Johnson scored 24 points and Jared Breece had 16 points for Pandora-Gilboa (26-2), making its first appearance in a state tournament. In a game that had eight lead changes, Marion Local took the lead for the final time on an offensive rebound for a basket and a free throw by Bruns to make it 52-51 with 2:11 to play. The Flyers raised their lead to three points twice after that, including 56-53, when Bruns hit both ends of a one-and-one with five seconds to play. “Nate got in some early foul trouble so we had to nurse him through the rest of the half. 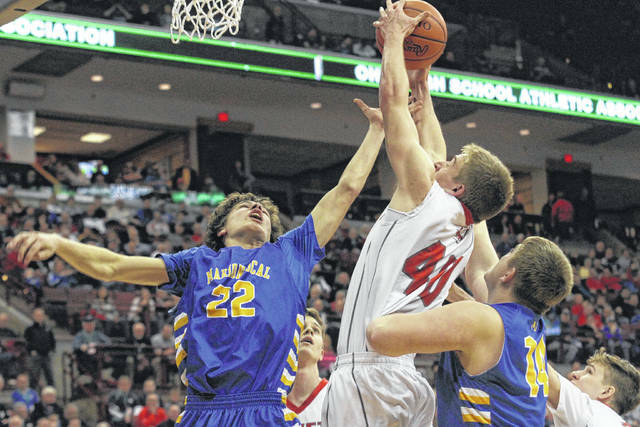 Tyler Mescher was a warrior for us inside in the first half (12 points, 4 rebounds in that half) and kept us in the ballgame,” Marion Local coach Kurt Goettemoeller said. “When it came to crunch time, No. 5 (Bruns) pretty much took over and got us through and was a big reason we won the ballgame,” he said. It was a game in which both teams brought their “A” games from the start and continued to play at that level for 32 minutes. Marion Local shot 58 percent for the game and P-G hit 54 percent. Turnovers weren’t an issue for either team — the Rockets had 11 of them and the Flyers had 10. “I don’t think either team had what you would call tournament jitters at the start. It was a good game from the start. We weren’t throwing passes away, they made shots early in the game, we made shots early in the game. Both teams were ready to play,” Goettemoeller said. If there was a statistical category that created some separation, it was rebounding, where Marion Local had a 24-13 advantage, which Pandora-Gilboa coach Joe Bradic saw as decisive. “The rebounds were huge in the course of that game. In most of our games we pretty much out-rebounded everybody we played all year. We got almost doubled up today. That was the difference in the game,” he said. Pandora-Gilboa’s difference maker early when it led by as many as five points early was second-team All-Ohio player Drew Johnson, who hit 7 of 10 shots, including 3 for 3 from 3-point range, in the first half. “He just made some tough shots early. He made some shots from distance. Later in the game we put more length on him. He’s an excellent shooter. We just didn’t want to let him shoot the basketball. The major change was putting more length on him,” Goettemoeller said. Marion Local starts two 6-6 players and brings a 6-5 player off the bench and that height and wing span caused problems at times for the Rockets. “We’ve played long teams but that team went to another level for long,” Braidic said. Pandora-Gilboa took a 51-49 lead with 2:35 left in the game when Cooper McCullough hit both ends of a one-and-one. That was the last time P-G would have the lead, though, Bruns’ three-point play 24 seconds later gave Marion Local a lead it would not let get away. 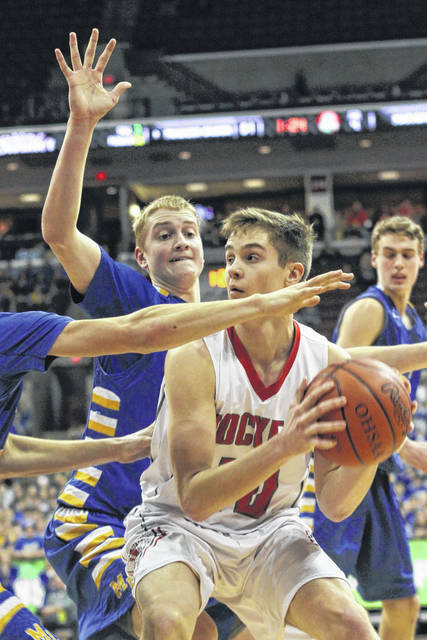 It didn’t get the outcome it wanted but Pandora-Gilboa left the Schottenstein Center proud of the effort on Thursday and of the journey that had gotten them there. “We’re blessed to be down here. Like Coach Braidic said, not a lot of people get to play here,” Johnson said. Marion Local has one more game to play. Cornerstone, the 2016 Division IV state champion, is led by D-IV state Player of the Year Michael Bothwell. Its schedule included 11 Division I schools during the regular season. 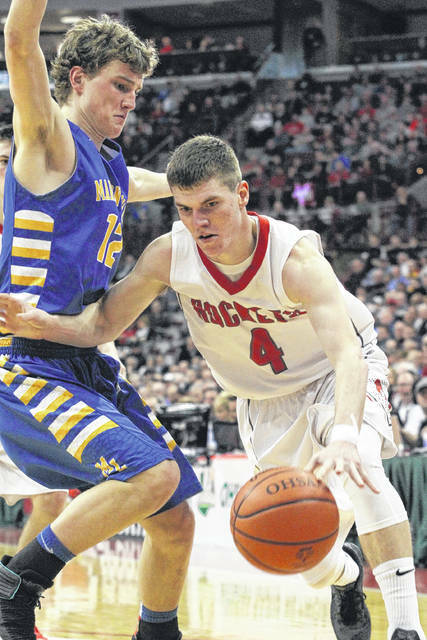 Cornerstone defeated Berlin Hiland 51-41 in Thursday’s other Division IV semifinal. “Against a team like that you’re going to have to get back in transition, you’re going to have to take care of the basketball and obviously with their athletic ability you’re going to have to rebound. If we do those things we’ll be in the game and if we’re in the game late, we will have a chance,” Goettemoeller said. This entry was tagged marionlocal, pandoragilboa. Bookmark the permalink.